Please refer to our stock # 1840 when inquiring. (A) River... ID 0405171106. Note update: Please search # 1368660 to see the revision placed in a gesso textured hand painted signed frame by the artist. (C) Crossing... ID 0310171102 - Sold - Thank you! (D) Hiker's... #00404171103 - Sold - Thank you! 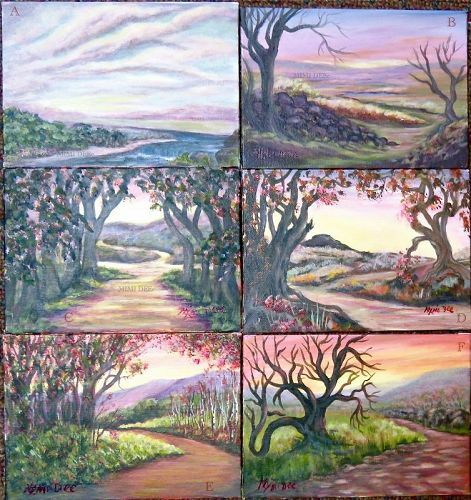 Each can be placed unframed on a small table top easel or framed by the collector. Particulars: The same very limited palette of three pigments plus white was used to paint all 6, resulting in neutral hues for pleasing, contemplative scenes. Great wedding gift ideas! All exhibited at a recent art show. Original work by this self learned artist who also forges sterling silver metal work studio jewelry and constructed fiber art to wear, has been exhibited in various area artist association shows since the 90s and at the previously open Methuen studio store gallery by the same name.